Holy crap! I will not be pregnant this time next month. Instead of having a tiny human inside my body, I will have a tiny human outside my body. Ignoring all of the crazy that comes with that realization, I find myself thinking a lot about how I’m going to feel about my body after the kiddo is out. I have an excuse for my klutziness. I have always been… let’s call it “less than graceful.” These days I have no abs (because I have been terrified to do any kind of ab work). I use a combination of arm strength, momentum, and (at the last minute) gravity to get myself out of bed. Thank goodness I live alone, because it is a comedy act that no one needs to see. I am hoping to be more agile after the kiddo’s arrival, but… let’s face facts. This is me. Agile is not my middle name. I have an excuse for my shape. I know my body is going to change and it is not going to change back to what it was pre-pregnancy. Before, I was having anxiety over my pregnancy body. Now I’m starting to have anxiety over my post-pregnancy body. I’m learning to be gentle with myself and my shape, but (and again, I have written about this before too) that will be a long journey. I have gotten really used to having someone kick me from the inside. Sometimes it is wonderful. Other times it is incredibly distracting. (I mean, distracting to the point where I can no longer think.) Regardless, I am very used to feeling her every so often, and more often every day now. I think I am going to miss that. I am starting to get really excited for the kiddo’s arrival. Every day, it feels more and more real, from seeing her room fill up with her things, to sorting her bottles, to feeling my stomach contract. 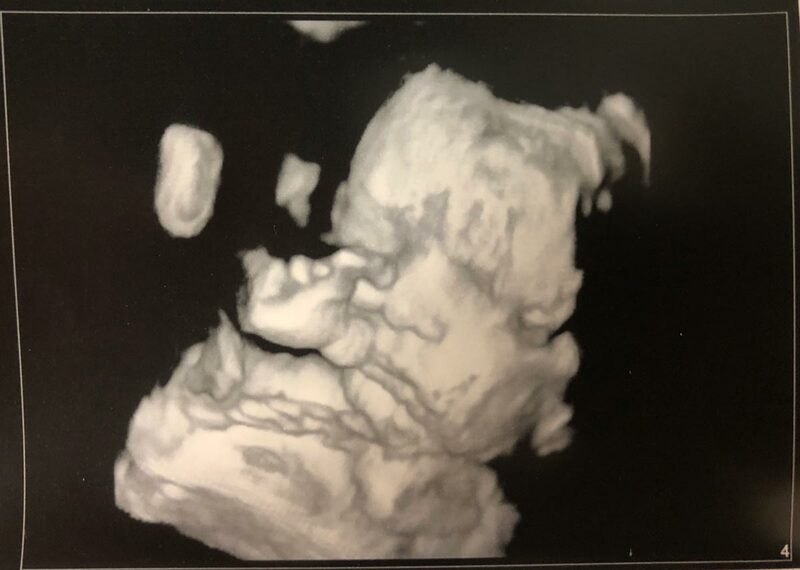 And then, a couple of days ago, I got to see her actual face for the first time, thanks to a 3D ultrasound. I mean… she has a face! A real human face! But seriously, this photo made her more real to me than anything - including all the kicking. I can’t wait to meet her in real 3D.